Will There Be Another Poker Boom (Anytime Soon)? There is nearly universal consensus that what is needed to improve today’s poker climate is another poker boom. It doesn't take a genius to understand that some sort of Moneymaker-like effect would do wonders for the poker economy. When considering all the relevant factors of the game, how likely is something like this to happen anytime soon? One of the points often brought up in these discussions is the return of online poker to the United States. Without trying to determine whether legal online poker will actually start another boom, let us just stop for a minute and consider the current climate across the ocean. Although a few states have come up with the required regulation and recently introduced the first interstate compact, it seems that regulating things at a federal level is still quite far down the line. If major regulation in the States is what is needed for another boom, I'm afraid we'll have to wait and hope poker hangs in there for the long run. We can't talk about the possibility of a new poker boom without mentioning Twitch, if for no other reason than because there are so many who firmly believe in the "Twitch revolution". Do I believe Twitch is good for poker? Yes, absolutely. I belong to the group of people who believe in innovation and can certainly see how Twitch.tv could pique the interest of new players who have not previously experienced the game. The introduction of Twitch.tv is not, however, enough to start another boom. The reach of poker content streamed via Twitch, although big, seems far too limited to start anything major. Add to that existing technical obstacles and it becomes rather clear that if we are talking about a legitimate poker boom, it will not be because of Twitch. Some people say that poker is dying. This is not true. Poker has been around for a very long time and I expect it to be a popular pastime for a long time to come. However, if we want to keep poker in the mainstream, we need to think about creative ways to revitalize the game. If poker is struggling, it's not because of high rakes or because everybody's solid; it is because an ordinary person doesn't perceive the game as interesting and appealing any more. We do need another boom and we can get it if we find the way to bring back the fun. It isn't a popular thing to say, but modern poker has become somewhat boring. The excitement, the thrill, the characters are becoming scarce. Without another Moneymaker winning a huge amount of money, which isn't all that likely to happen, we are left to our own imagination. Sadly I cannot magically pull the solution out of the hat, but one thing that can be done is to actively try to find something that would restore some of the glory from a decade ago. It isn't as easy as waiting and hoping that someone else will come up with the magic solution. I have a feeling that if we want another poker boom, we will just have to come up with one on our own. 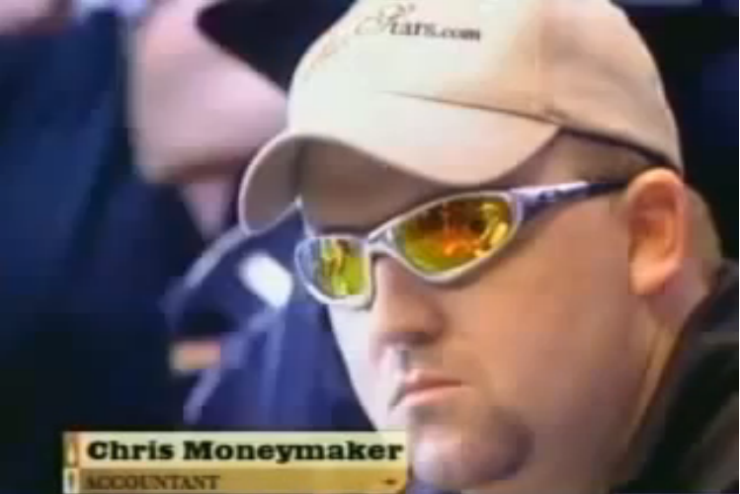 Image of Chris Moneymaker - screenshot from video of his 2003 WSOP "Bluff of the century" vs. Sam Farha.